Summary: With a generous donation, George Mason University Law School will be renamed in honor of the late U.S. Supreme Court Justice Antonin Scalia. George Mason University Law School will soon become the 10th law school to honor a U.S. Supreme Court Justice. With the help of a $30 million donation, the law school will become Antonin Scalia Law School. Scalia, a longtime Northern Virginia resident, died less than two months ago after serving as a Supreme Court Justice for roughly 30 years. He was a guest lecturer at the law school in Arlington, VA and spoke at the dedication of the law school building in 1999. 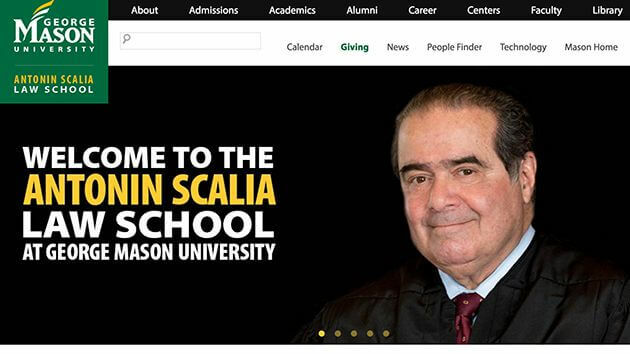 With the announcement of a new name for the law school as Antonin Scalia School of Law, social media didn’t take long to point out the acronym for the school. Jokes quickly surfaced as “ASSLAW” and “ASSOL.” Once school officials realized the unfortunate name, the sent a letter out to alumni that the name would be tweaked to eliminate the jokes over the acronym. Read George Mason University Recruits Judge Douglas Ginsburg as Full Time Faculty. The donation is the largest in the university’s history with $10 million coming from the Charles Koch Foundation and $20 million from an anonymous donor that wanted the money to be used towards renaming the school after Scalia. The donations will also allow the three new scholarship programs and more faculty members. The State Council of Higher Education for Virginia must first approve the name change.